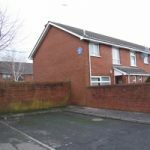 Sam Thompson was born on 21 May 1916 in 2 Montrose Street, Ballymacarrett in East Belfast. The house was demolished in redevelopment and the site is now vacant. He worked in the nearby shipyard as a painter from age 14. After the war he worked for a while for Belfast Corporation. 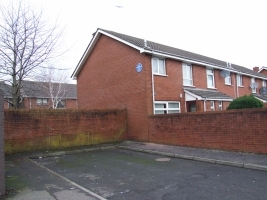 He was an active trade unionist and member of the Northern Ireland Labour Party. He actively opposed the practice of religious discrimination he witnessed in the Corporation and was dismissed for his pains, subsequently setting up his own business. Thompson was a keen observer of the community in which he grew up. In the mid-1950s Sam Hanna Bell, the writer and broadcaster, then a producer in the BBC, heard him telling tales of the shipyard and its characters and encouraged him to write for radio. Over the following three years the BBC broadcast Brush in Hand (1956), Tommy Baxter, Shop Steward (1957), The Long Back Street (1958) and The General Foreman (1958) as well as the serial The Fairmans (1958). In 1955 he began work on a stage play, Over The Bridge, about the dilemmas of trade union officials faced with an eruption of sectarian conflict in the shipyards. James Ellis, Head of Productions of the Ulster Group Theatre, accepted it for production. However in May 1959, a fortnight before it was due to be opened, the Board of the Theatre withdrew it on the grounds that it was ‘full of grossly vicious phrases and situations that would undoubtedly offend and affront every section of the public. It is the policy of the Ulster Group Theatre to keep political and religious controversies off our stage’. 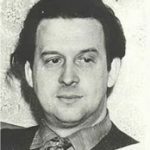 There was uproar; James Ellis and many others resigned from the Theatre and set up new company, Over The Bridge Productions, that on 26 January 1960, staged the play in the Empire Theatre. It was a resounding success, and far from creating conflict was widely praised for its realism and originality. The play toured Dublin, Scotland and England was was received with acclaim. 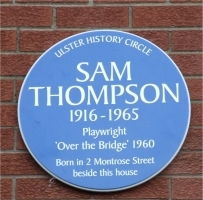 Thompson wrote three more plays; The Evangelist staged in the Grand Opera House in 1963, Cemented with Love a TV play screened in 1965 after his death and The Masquerade, which was discovered after he died. 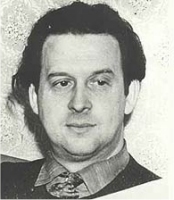 Thompson stood unsuccessfully for the NI Labour Party for the Constituency of South Down in the 1964 General Election. He died, of a heart attack, on 15 February 1965. Over The Bridge is ‘regarded as an important turning point in the history of Northern Ireland’s cultural moderinisation’ (Lionel Pinkerton). Northern Ireland theatre was never to be the same again.